March 18, 2019 - KuCoin, an IDG-backed global cryptocurrency exchange, today announced its partnership with CV Labs & Tokengate. 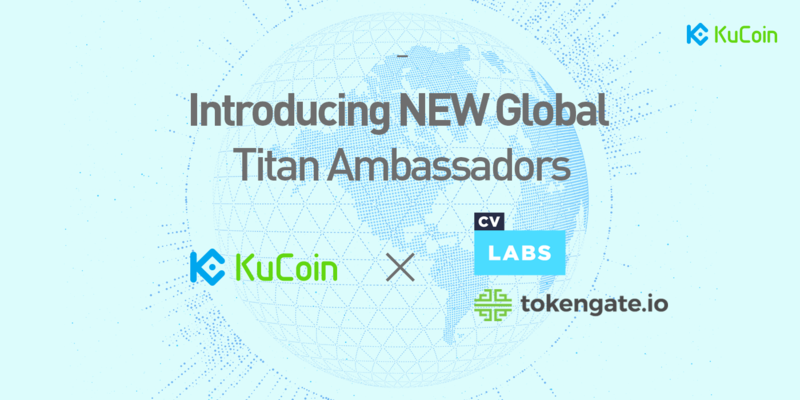 Based on the collaboration, CV Labs & Tokengate will join KuCoin’s Global Titan Ambassador program, working with the KuCoin team to discover more promising projects. Also, KuCoin will become the ecosystem partner of both CV Labs and Tokengate, contributing to the empowerment of blockchain and crypto companies who settle in Zug. Switzerland and Liechtenstein is home to over 750 blockchain-related companies, with many pioneers and pace-setters among them. Located in the heart of Switzerland’s Crypto Valley, CV Labs, together with other partners, is dedicated to helping blockchain-related companies by providing a wide range of services from business and technology advisory to project financing with Tokengate. As the “People’s Exchange”, KuCoin is always committed to bringing the most valuable digital assets to its 5 million users globally. As of now, the platform has listed over 180 tokens, including nearly 400 trading pairs. Initiated in August 2018, KuCoin’s Global Titan Ambassador Program is targeting investment firms and influential individuals in the crypto space. Projects suggested by ambassadors will be checked by the KuCoin team as a priority and given fast-track treatment if approved for listing. Current KuCoin Global Ambassadors include Breyer Labs, NEO Global Capital (NGC) and LFG Global. The KuCoin Exchange opened for cryptocurrency trading in September 2017 and enjoyed steady growth into 2018. The KuCoin exchange puts a high priority on the quality of the projects listed based on a well-trained research department that scours the blockchain industry for the highest-quality projects. KuCoin provides an exchange service for users to conduct digital asset transactions securely and efficiently. Over time, KuCoin aims to provide long-lasting, increased value to its more than five million registered users, in over 100 countries. In November 2018 ‘The People’s Exchange’ officially partnered with IDG Capital, Matrix Partners, and Neo Global Capital. CV Labs is a unique place in Crypto Valley where great minds and new ideas come together to discuss and to innovate. Opened in February 2018, the genesis hub is located just near the train station of Zug and offers more than 2000 square meters of co-working space and private offices. Currently, CV Labs is the home for more than 120 blockchain startups and an incubation program. Tokengate is the market infrastructure to fully regularly compliant onboard people to the crypto world and emit tokens into the primary market. As such an ideal partner not only to find the “hidden gems” but also the trader community.